The Blendtec brand started with the vision and innovative thinking of Tom Dickson. The company’s journey to success began in 1975, when Tom’s curiosity motivated him to use a vacuum in cleaning wheat kernels. His inquisitive mind was never quite satisfied, as he further modified the machine he was working on to revolutionise the wheat milling process. He used his very own stainless steel milling heads and mixers in making wholesome bread. He made sure the machines were enhanced with auto knead and auto off features. Over the years, Tom continued to enhance the features of his mixer. In fact, it was then that he pursued his idea of a blender with a square jar and let go of the traditional round shaped jar. His blenders were modified and improved throughout the years, until such time that he had come up with a line of innovative blender products which proved to be a huge hit. The sale of Blendtec blenders even picked up with the release of the Will It Blend Series, a popular series on Youtube which featured Blendtec founder, Tom Dickson, attempting to blend different unusual items like phones, iPods, golf balls, human skulls and marbles to show just how powerful his blenders can be. A few decades after, Tom Dickinson and his team are still as passionate as before. Not to be satisfied with any creations, the popular engineer and inventor, along with his creative engineers, still find ways to perfect the features of their Blendtec blender products. The engineering team of Blendtec, mostly composed of high profile engineers from various parts of the globe, all work together in harmony to create innovative blending machines that never fail to impress. Today, Blendtec blenders are being used by more people in their private kitchens and in their business endeavours. It is easy to know why Blendtec products often sit on the countertops of restaurants, cafes, smoothies shops and bars. 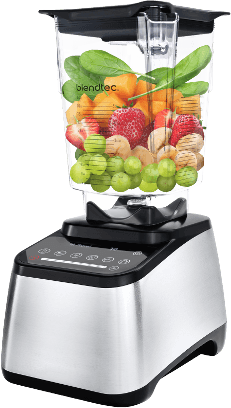 Built to withstand strict commercial standards, Blendtec blenders are one of the most powerful and most innovative blending machines available in the market today. The features of every Blendtec product are simply impressive. The Blendtec blender has a spacious jar or container that is easy to clean. It also has a convenient jar design that leads ingredients towards the blades, therefore eliminating the need for a tamper when ingredients get jammed. In addition, the Blendtec blender has a uniquely built two prong blades that are blunt and yet so powerful. The blades are eighty percent thicker and more powerful than other blades. Built with a touch screen interface, this blending machine offers pre-programmed cycles. The company has offered preset programs for many years to enable you to press a button and simply walk away while blending. The program cycles can be extremely convenient for those who do not wish to manually control the blending process. So what are you waiting for? If you want an awesome, powerful blending machine, call Nature’s Glory to order your Blendtec blender today!